I said the kids were obsessed with Potter and I meant it. 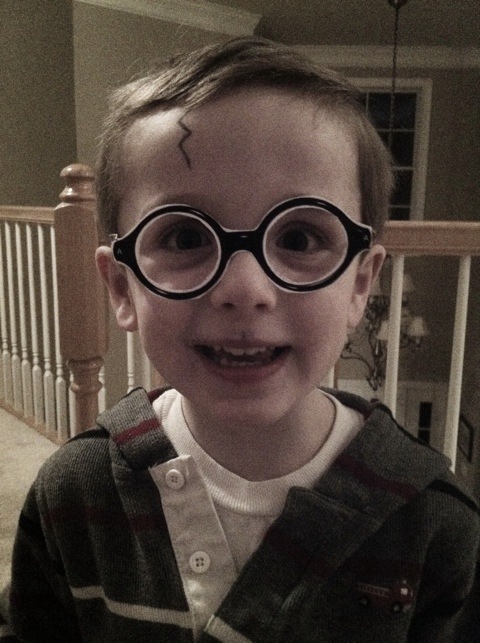 Take a peek at Kyle sporting his scar & home-made glasses. Doesn’t he look like Harry Potter? He has also now requested to start wearing a tie which looks totally adorable. He wants to buy the official “Harry Potter” tie when we visit the Wizarding World of Harry Potter next week along with a wand so he can take the look to a new level. Looks like I’ll be out a ton of money as Kenzie and Kyle prepare to hit the shops of Diagon Alley……. You can buy a bunch of these Harry Potter props online too it looks like but certainly the experience of shopping in Diagon Alley will be the kids shopping excursion of a lifetime. I wanted to thank you for this wonderful read!! I certainly enjoyed every bit of it.